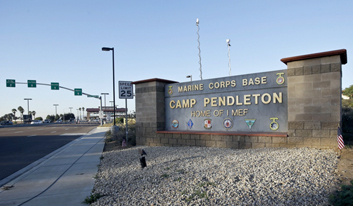 This project upgraded an existing 12kV electrical SDG&E service at Marine Corps Base Camp Pendleton. The scope of work included the removal and demolition of existing 200A switchgear and removal of 200A overhead line on four poles. The project installed new 1200A 12kV switchgear and installs 15kV underground copper conductors, HDPE conduits using horizontal boring, handholes and other related incidental work. Dynalectric was the prime contractor on this project. As such design and construction services were provided. This project was successfully completed on schedule and within budget. Relocation of the overhead feeder to be underground, allowed the site for further expansion of the facilities at Area 41. This was one of the 22 projects completed on the Camp Pendleton base with funds from the American Recovery & Reinvestment Act of 2009.